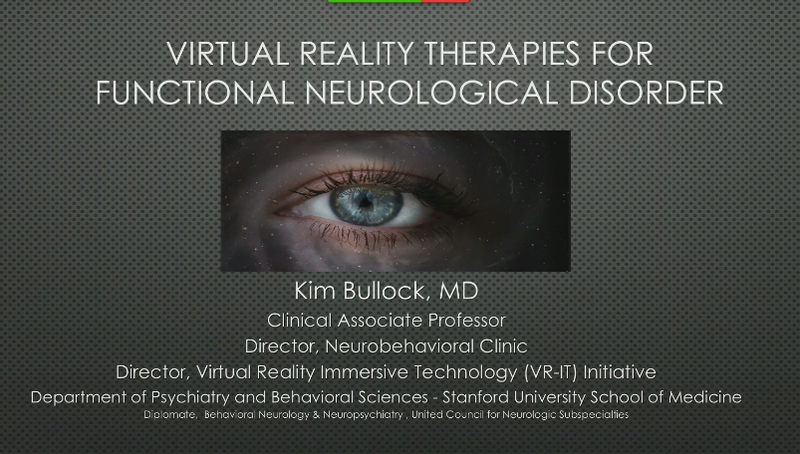 Stanford Psychiatry's Virtual Reality & Immersive Technology (VRIT) Program, directed by Kim Bullock, MD, is the first clinically focused academic endeavor dedicated to studying immersive technologies such as virtual reality (VR) and augmented reality (AR) in mental and behavioral health settings in a broad range of disciplines. We are a group of interdisciplinary academics passionate and called upon to evaluate, innovate, and disseminate advances in the field of virtual and augmented reality technology in real world clinical settings. Our internal experience is powerfully shaped by physical sensations. VR is a technology that is capable of creating perceptual illusions that can change how you feel and possibly what you believe. Your own imagination can also be thought of as the original virtual reality device. VR is actually an extension and a booster for the imagination. For example, VR can deliver the visual and tactile experience of having poisonous spiders crawling on your body which can illicit intense emotions and urges to escape. It can do this much more intensely than simply imagining this scenario. With the recent development and merging of three dimensional cameras with wearable and other tracking devices, we can now can provide realistic and immersive experiences that are customizable. We can now personalize and precisely create experiences that can create experiential illusions that can take you to a different location, give you a different type of body, or enable you to interact in a specific social setting. This technology provides an unprecedented level of accurate, objective, measurement based data for behavioral scientists to analyze. Some perceptual illusions show potential to permanently change the motor, sensory, and emotional systems of the brain. Our program is using these devices to transform mental, physical, and behavioral functioning. As immersive technology and innovation moves forward, it is important that accurate assessment of its safety, efficacy, and effects on human behavioral, mental, and physiological health is observed and reported. Many of the labs in our program are involved in assessment of these objectives in their own or others innovations. In addition, measurement based care and the electronic records systems in our clinics are allowing analysis of VR interventions and their outcomes in new and efficient ways. We perform evaluations of immersive technology in a myriad of ways. At the most basic level we are performing feasibility evaluations by activities such as providing real world clinical expertise feedback to developers. We also have created clinical focus groups of providers or patients as needed. More complex evaluative activities include clinical feasibility and efficacy trials using internal and external research funding or industry sponsored grants. Whether it be a thru a small business innovation research support (SBIR), internal seed grants, private donations, or large sought after NIH/NIMH multisite trials, VR-IT is dedicated to protecting the safety of consumers, discovering the facts, and documenting the effects of immersive technologies on the human nervous system. It is important to distinguishing truth from claims with rigorous scientific design. Our independent academic laboratories have systems to minimize conflicts of interest making us a wonderful unbiased partner in developing emmerging technology thru the evaluative process. Psychiatry’s VR-IT program is uniquely positioned within a large psychiatric care system and series of clinics allowing bedside observations and hypotheses to be made. Mental and behavioral health providers are sometimes in the best position to come up with inventions and brainstorm ideas for helping patients and providers to effectively use VR/AR technologies. Stanford campus, its community and location within the Silicon Valley offer incredibly rich networks of collaboration for developing immersive therapy ideas. Below are some examples of the bright ideas that have emerged from our unique vantage from groups within the department who have some bright ideas for harnessing immersive technology for creating good. Please contact us if you’d like to be involved or have ideas for us at Stanford’s VR-IT program. virtual reality (VR) tailored toward targeted rehabilitation of the affected brain networks in patients with neurocognitive disorders. Stanford VR-IT Program interfaces with community at many systems levels. We want to be a leader in the creation and dissemination of best practices for virtual and immersive technology in mental and behavioral health. Below you can see the ways we collaborate and share information to improve care. If you'd like to be involved, please drop us a line here. SPIT-C is an interdisciplinary team composed of researchers, providers, developers and other stakeholders dedicated to transforming immersive technology into agents of change for behavior and mental health. Stanford Community and beyond are members and others are encouraged to join with us. Innovation cannot happen alone. Join the network of conversations today! Click here to sign up! Follow the link below for more information and video (SUNet login required) of the event. For more information about VR-IT, getting involved, and supporting our mission, please fill out the form below. Please note this form is not intended for patient or clinical use.